*Most of mom always put the snack into a bag to your child, but it would be unavoidably spill out to anywhere. I think it maybe the headache problem to most of mom. And their kids could not enjoy the delicious food so well. *Now the Gyro Bowl are the best solution in this situation. *No more spillage cause by kids. *With gravity-defying engineering, dry food and snacks stay inside the bowl and off your floor no matter what kind of high-flying fun your kids get into.They will not worry about the food are throw out anywhere because of this gyro bowl. *Designed with a gyro shape, just like a toy for kid. When they enjoy their food, they can play with it as well. It will must come a lot of fun to your kids and let mom are out of trouble. *Plus, we added three handles for easy carrying and lid to cover the food when not in use.Easy to carry outside, Just hang on your Baby car. *Multiuse-Not only for food, you can use it for place your small office equipment such a clip, pin, needle or coins. Also, it makes an unique gift for your close ones! 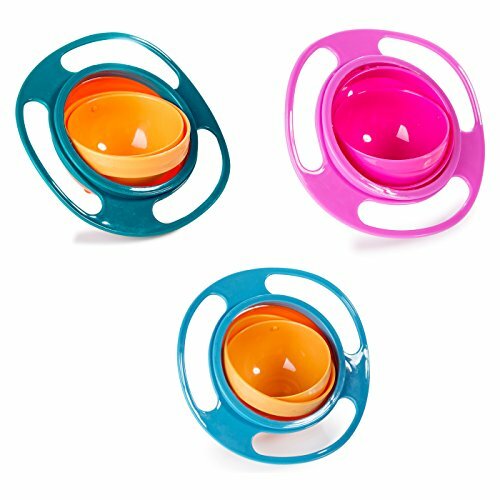 Most Innovative Gyroscopic Anti Spill Kids Bowl : Are you tired of having your kids spilled their food? This Gyro Bowl comes to solve that problem! We designed this bowl with you and your kids in mind. It has anti spill design, in which the inner bowl with gyroscopic motion can rotate 360 degrees to keep dry food inside and avoid food spilling. Plus, we added three handles for easy carrying and lid to cover the food when not in use. Super Attractive Bowl with Planet Saturn Design : Not only it's perfect for keeping your children's mess to a minimum, but it also looks like a cool Planet Saturn. Kids will definitely love it! It's common for children to be a picky eater, and this bowl will at least attract them to eat. The vibrant color is so eye catching. Premium PP Material For Durability and Safe Usage : This bowl is made of 100% food grade PP material, it is FDA approved and BPA free which means high safety for your kids. The Gyro Bowl is durable and simply won't break, crack, discolor,warp,melt or flake away. It also doesn't change the nature of the food you put in there. Quick to Clean, Dishwasher Safe : With such creative design, it's surprisingly easy to clean. Just wash it gently in warm water or put it in dishwasher. Save trouble cleaning anytime, anywhere. If you have any questions about this product by Berry President, contact us by completing and submitting the form below. If you are looking for a specif part number, please include it with your message.